Microsoft Flow is an one of the app from Office 365 used for automate the workflow process by connecting multiple applications. In SharePoint Online, we have a Flow button enabled in each List or Library Command Bar. By using that button, we can create a new flow for that List or Library and also we can start the flows associated to that respective List. The web object from SharePoint Online has the property “DisableFlows” to enable or disable the Microsoft Flow option for the SharePoint Site. What is PnP JS Library? 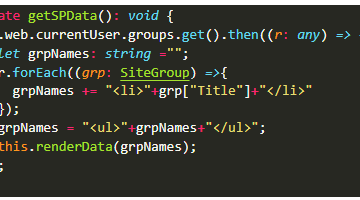 The below code snippet used to disable the Microsoft Flow for all lists and libraries for the SharePoint Site. The below code snippet used to enable the Microsoft Flow for all lists and libraries for the SharePoint Site. After this update, every Lists and Libraries will get the Flow button in its Command Bar.